One of the things that matters most to me in my journey as a mother, is raising a child that can empathize, relate to, and communicate with any person in the world. I'm trying to raise not just a responsible U.S. citizen, but also a respectful, contributing global citizen. I want them to be able to travel anywhere and be able to interact with the community and it's people. I want them to be able to visit a culture and find the beauty that exists. I don't want them to view differences as something to be feared, but something to be recognized and appreciated. I don't expect my kids to agree with everyone or to adopt every tradition or belief, but I do expect them to respect the rights of others to live and believe as they wish. I don't think that I'm the only parent who feels this way. 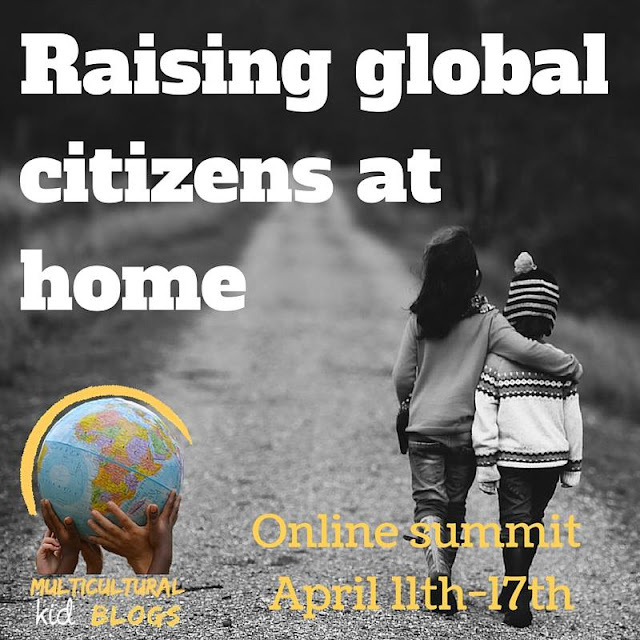 So I'm delighted that my dear friends at Multicultural Kid Blogs have come up with the brilliant idea to create a FREE online summit for parents (and educators)! In it you'll find tools and resources to help you raise your young global citizen. The free "Raising Global Citizens at Home" summit starts today! I will have the honor of sharing the virtual stage with a line-up of fantastic speakers in the “Raising Global Citizens at Home” online summit. Join us to find inspiration and ideas on how to use arts and crafts, music, food, play, movement, travel, language, books, apps and other media to raise the next generation of globally-minded world citizens. All you have to do is REGISTER HERE and you will gain free access to all the videos and resources (which you can enjoy at any time that is convenient for you) and a workbook that you can use at home with your kids. I have to say THANK YOU to our hosts (Leanna Guillen Mora of Multicultural Kid Blogs, Olga Mecking of The European Mama, Lana Jelenjev of Smart Tinker) and to our organizers (Annabelle Humanes of The Piri-Piri Lexicon, Rita Rosenback of Multilingual Parenting, and Varya Sanina-Garmroud of Creative World of Varya) for putting together this amazing resource for parents! Monday, April 11: Why is it important to raise global citizens? Tuesday, April 12: How TRAVEL supports global citizenship. Wednesday, April 13: How FOOD connects us in a global society. Thursday, April 14: How ARTS and CRAFTS promote global citizens. Friday, April 15: How PLAY encourages global citizenship. Saturday, April 16: The importance of MEDIA, APPS, and BOOKS in raising global citizens. Sunday, April 17: The role of LANGUAGE in raising global citizens. What are you waiting for? Go register and start watching!